For all you users on Rogers and you want a data plan for your iPhone, it’s going to cost ya. Even though Rogers recently came out with an “unlimited mobile browsing” plan for $7, it does not apply to non-Rogers cellphones! Just got off the phone with Rogers “Customer Service”. I traveled to Germany and used my iPhone for just two days. Rogers charged me for 22 MB on these two days $1148. In my opinion this is ridiculous! If I wouldn’t have stopped using my Rogers phone after two days and used it for the rest of my stay (14 days) my phone bill would be $8036… just for data usage. At Rogers they think this is a valid price. I am recommending everybody with a similar experience to call Customer Service and be tough! Don’t speak to normal call center staff. Ask for a supervisor. I got a 50% discount on the data bill. That’s still more than $25 per megabyte. Compared to the $3 per megabyte for over plan usage a total rip-off. If I would treat my customers that way… I would be bankrupt within no time. So there you have it…the last time O_ssie posted about upcoming changes to data plans, he was correct. So right now we’re assuming that hopefully this post will also come true! By all means, these prices are not great at all–but they are a start in the right direction. I’m still dreaming of a $15 unlimited data plan, like all you lucky Telus users out there. Could you imagine having that on your iPhone? Now that would be incredible! What data plan are you guys using on your iPhones? 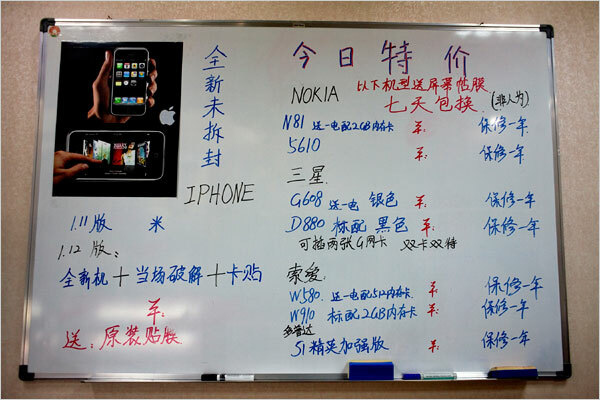 iPhones From China–iPhones to China!